Are processed foods finally on their way out? The public doesn’t trust manufacturers like Kellogg’s and Kraft anymore. 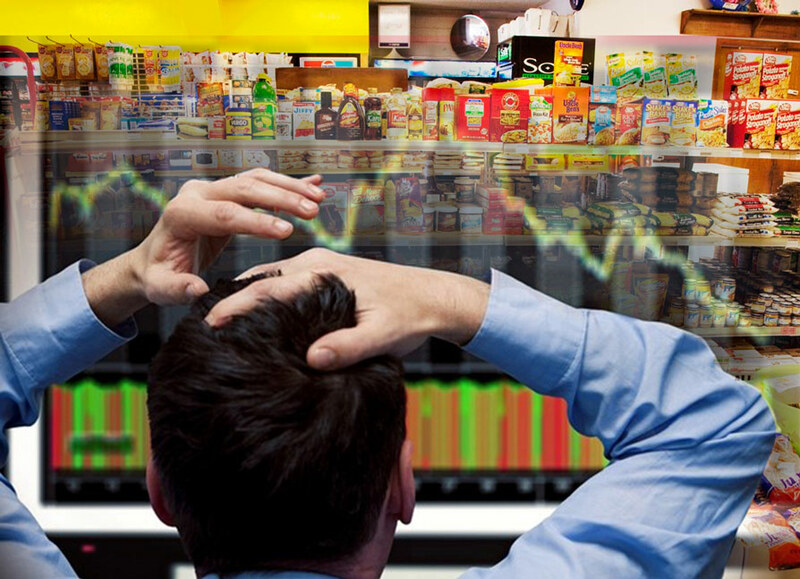 Earnings are falling, and dozens of Big Food companies’ stocks are down. One of the biggest food companies in the world, ConAgra, is even slashing its 2015 earnings projections. Is Big Food really over? ConAgra is changing management – is it because their 2015 earnings projections are way are down and stocks took a plunge recently? The food giant owns brands like Hunts, Swiss Miss, as well as Chef Boyardee, among others. Do people really want to eat cancer-causing chemicals in a can anymore? Kraft, the maker of Oscar Mayer deli meats, Jell-O, Maxwell House coffee, and Velveeta cheese also recently shook up top management and reported sluggish sales. Big Food company, Kellogg’s, has seen its sales plunge 5.4 percent over the past year. Big Food is simply floundering. People don’t want toxic chemicals in their beer, in their cereal, or in their milk. Is this also why retailers like Target are doubling their organic and sustainable products, and organic food sales are expected to be over $35 million in 2015? Is this why farmers are turning to non-GMO seed, and people are turning to local food co-ops or even starting to grow their own food? Is “American cuisine” finally going to mean something besides processed junk? It looks like Big Food is on a path to self-destruction – at least unless they make some serious alterations to keep up with what the people want. It’s about time we wised up. Not long ago, the great processed-food companies like Kraft and Kellogg’s towered over the US food landscape like the high hat that adorned the head of Chef Boyardee, the iconic canned-spaghetti magnate whose empire is now owned by ConAgra. But now, Big Food has fallen on hard times. Conagra, which owns Hunts, Reddi Whip, Ro-Tell, Swiss Miss, and Orville Redenbacher, along with Chef Boyardee, recently slashed its 2015 profit projections and sacked its CEO. Kraft—purveyor of Oscar Mayer deli meats, Jell-O, Maxwell House coffee, and Velveeta cheese—also recently shook up top management and reported sluggish sales in 2014. Cereal titan Kellogg’s has seen its sales plunge 5.4 percent over the past year, Advertising Age reports. There’s a “mounting distrust of so-called Big Food, the large food companies and legacy brands on which millions of consumers have relied on for so long,” said Campbell Soup’s CEO. What gives? Part of the problem is currency fluctuations. Having conquered the US market, Big Food for years has looked overseas for growth. Recently, a strong US dollar has cut into foreign profits, because a pricier dollar makes overseas sales worth less when they’re converted to the US currency, as the Wall Street Journal recently reported. Currencies rise and fall, but the real specter haunting the industry may be something less ephemeral than the dollar’s gyrations. Campbell Soup CEO Denise Morrison—whose company makes V8 juice and Pepperidge Farm baked goods along with soup—recently publicly declared that there’s a “mounting distrust of so-called Big Food, the large food companies and legacy brands on which millions of consumers have relied…for so long,” reports Fortune‘s Phil Wahba, in an account from a conference at which Morrison spoke. Morrison also cited the “increasingly complex public dialog when it comes to food” as a drag on Campbell Soup’s and its competitors’ sales, Wahba reports. In other words, Big Food successfully sold a vision of cooking as a necessary inconvenience, to be dispatched with as painlessly as possible—open a soup can for dinner, unleash a squirt of artificial cream onto a boxed cake for dessert—that’s starting to lose its charm. Interestingly, Katz and Meller found that as long as you stick to the “minimally processed” bit, it doesn’t much matter which diet you follow: low-fat, vegetarian, and Mediterranean have all shown good results. Even the meat-centered “paleo” approach does okay. The authors conclude the “aggregation of evidence” supports meat eating, as long as the “animal foods are themselves the products, directly or ultimately, of pure plant foods—the composition of animal flesh and milk is as much influenced by diet as we are.” That’s likely because cows fed on grass deliver meat and milk with a healthier fat profile than their industrially raised peers. Meanwhile, as Big Food flounders, sales of fresh food grown by nearby farmers continues to grow at a pace that would make a Big Food exec salivate. A recent US Department of Agriculture report found that there are now 8,268 farmers markets nationwide—a jump of 180 percent since 2006. Then there are regional food hubs, which the USDA describes as “enterprises that aggregate locally sourced food to meet wholesale, retail, institutional, and even individual demand”—the kind of operations that can move fresh food from local farms to, say, grocery stores, so you don’t have to show up at the exact right time at the farmers market to get your local collard greens. Food hubs, the USDA reports, have jumped in number by 280 percent since 2007. Finally, there are schools—a site long dominated by Big Food, where little consumers learn eating habits before they emerge into the world as income-earning adults. According to the USDA, school districts with farm-to-school programs grew by more than 400 percent between 2007 and 2012. For decades, “American cuisine” was an oxymoron, the punch line to a sad joke. Billions of dollars in profits have been made betting on the US appetite for processed junk. Those days may be drawing to an end. The banksters are planning on destroying your ability to grow real organic food by all means, while placing mass production structures for 12 major cities under agenda 21, now called 2030 and agreed to by principal by Petrus Romanus who has already fulfilled the prophetic term… He will come in his own name,( at the UN ) and him you will accept. ( well, at least most of the 1.2 billion catholics anyway ) What the masses are being taught in the denominations, is NOT what Jesus taught. You want sensible ? Ask yourself why the real Jew ( Torah ) is the healthiest and wealthiest on earth. They don’t even have Jesus, yet the law still works. So… HAVE BOTH as did the lost tribes which make up most of the denominations. Come out of the whore. For organic growth, use black magnitite sands as shown by Dr Milewski’s plants ( 10 fold growth ), and use the cheap cost of a geodesic biodome found at biodomerevolution.com Kasper P. will provide the plans. You can also place a small aquaponics kit inside on the north wall. Due to the TPP all food will be radiated to be acceptable, and GMO anyway. Power everything using the Keshe plasma generator, and include his lifetime battery, or you can use solar and small scale wind, to generate hydrogen for storage, in liquid, instead of gas that takes a lot more space. Here is a great example of a closed loop system, for energy. https://youtu.be/Vel9LH57RII Mike S. Home hydrogen system for energy independence.